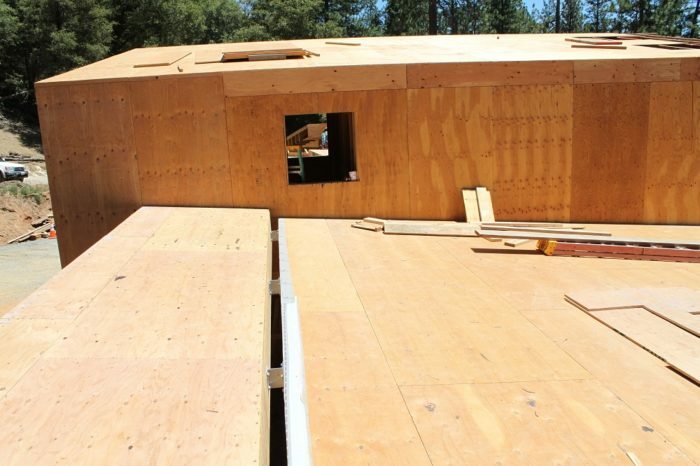 The finished roof over the first story of the California house will be one sleek, continuous plane when it’s done. 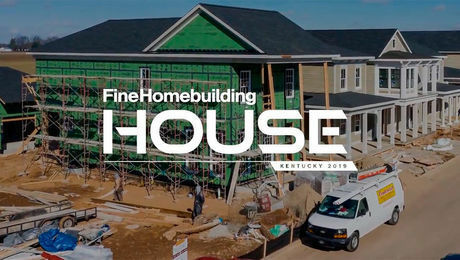 However, we had to come up with some unique framing details to keep that clean look while also reducing thermal bridging. There are several roof areas that are not over conditioned space: the porch, the north overhangs, the breezeway, and the master-bedroom balcony. 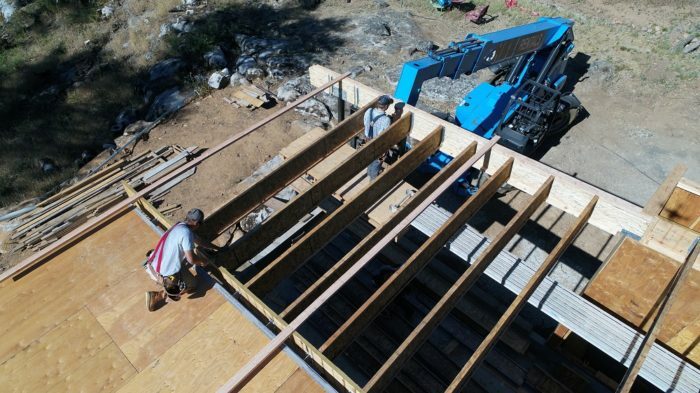 This created the need for several unusual transitions across the roof framing. 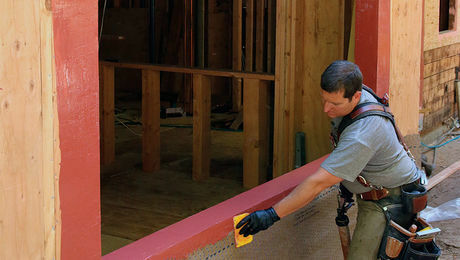 Because we want the exterior insulation to wrap continuously up the walls and over the roof, we fastened the various ledgers and overhangs to the walls at these transitions with Maine Deck Brackets. 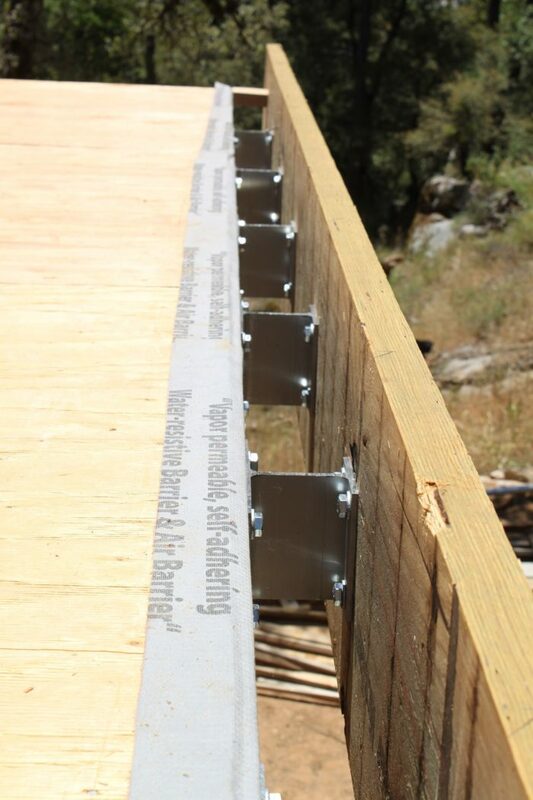 The I-beam-shaped aluminum brackets provide a standoff of 4 in. 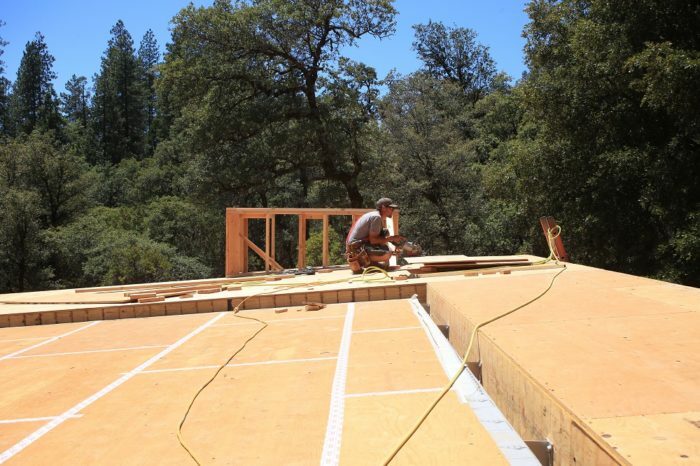 from the framing, which is exactly equal to our exterior Rockwool mineral-wool thickness on the walls, allowing the insulation to slip behind these framing elements on its way up over the edges of the roof. The aluminum standoffs hold the ledger 4 in. off the building to reduce thermal bridging. This ledger is for the porch roof on the west end of the house. 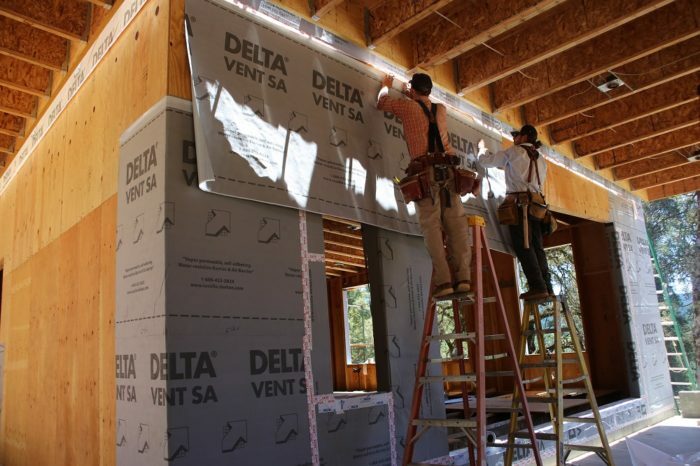 A strip of the water-resistive barrier (WRB), Delta Vent-SA, is run at the top of the wall before bolting the Maine Deck Brackets in place so that there’s a continuous air barrier. With the ledger in place, the roof of the large covered porch is framed with Trus Joist TJIs. The overhangs on the north side of the house are also attached with Maine Deck Brackets. Once the overhangs and porch roofs are framed, the crew integrates the air barrier/WRB with the strip that was installed behind the ledgers. 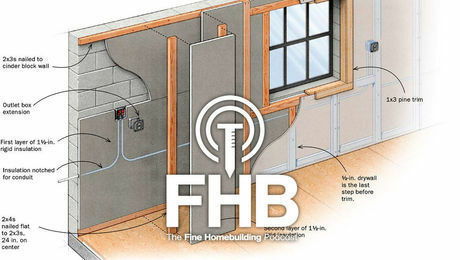 This view shows the first-story roof over the mudroom and first-floor bathroom (covered in black Delta Vent S underlayment), and the plywood sheathing of the breezeway roof to the right. It’s easy to see how the height of the ledger attached with the Maine Deck Brackets is 5 in. above the roof over the conditioned space of the house. The two roof surfaces will be in plane when 5 in. 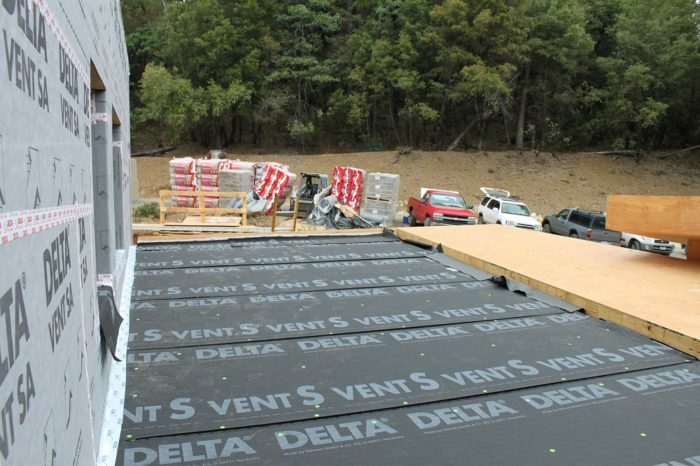 of exterior Rockwool insulation is placed on top of the Delta Vent S.